L to R: Dave Sexton, ?Andrew Davies, Enda Burke, Colm Riordan (Seven Springs CC PRO) Andy Conaghy (Seven Springs CC Chairman), Brian Duane, Annette Minou, Ann Burke, Johnny Mannion. Seven Springs Cycling Club are once again proud to host their annual Grand Prix race meeting this Sunday March 19. The event, based in Carrabane, Athenry, is one of only six such events held each year in Connacht and attracts the cream of Ireland’s amateur racing cyclists. 2017 is the fifth edition of the event which was first run in 2013. The club itself was established 2010 and its membership has grown to accommodate adult cyclists of all ages and abilities. Chairman Andy Conaghy believes that the current media emphasis on health and fitness is helping to raise the sport’s profile. “I have often wondered why so many people drive to a gym to ride a bike! We are lucky to live in a beautiful country; just ask anybody who has ever take a spin up to the top of the hills in Derrybrien or to the Burren in Clare or to Connemara. "It would appear that there are many who share Andy’s opinion; Seven Springs’ membership has grown from a handful in 2010 to 76 in 2016; the hope this year is to pass the magical 100-member mark. While the Grand Prix weekend is an annual target for the club’s racers, it is the participation in leisure events that the majority of the club’s members aim for from early spring until well into the autumn months. 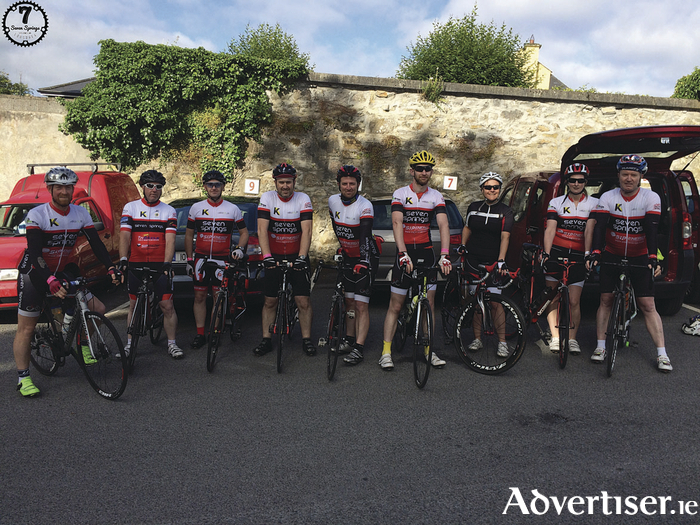 This year, 16 hardy souls are aiming to complete the Mizen to Malin challenge over the 3 days of the August Bank Holiday, headed up by club stalwart Johnny Mannion. The club boasts a small but growing racing group and they will be competing at the Grand Prix this weekend. The club also recently launched a new ‘Social Cycling’ initiative, aimed at giving people the chance to try the sport from an absolute beginner’s level. Seven Springs count on the support of numerous local businesses for sponsorship. Mark McKeigue of Velocity Bikestore, Turas Bikes and The 53 Coffee house is an active club member as is Ciaran Cannon of the Village Theatre and Owen Coughlan of OPC. Aidan McCarthy of SmartBiz is new to the club for 2017 and Johnathon Gibson of the Athletes Clinic, is always on hand for any performance, dietary and nutritional guidance.